Dogs suffer from itchy paws for many reasons. A dog may have severe allergies to their food, grass, pollen and mold that cause them to bite and scratch on their paws. A dog may have slightly injured its paw on rocks or debris, which is causing it to itch. And, it isn't uncommon for dogs to itch and bite at their paws out of sheer boredom. 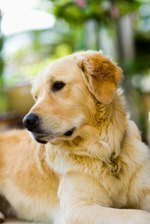 There are home remedies for itchy paws that will help alleviate the itching symptoms for the dog. These home remedies have to do with diet, baths and topical creams from your home. Begin by making sure your dog is not allergic to the food you are feeding him. If you are feeding him a generic dog food that uses fillers and preservatives, there is a chance he is allergic to these ingredients. There are many kinds of natural and organic dog food that may alleviate any food allergies your dog may have and are making him lick and bite at his paws. Look for a high quality dog food that is meat-based. Natural and organic dog foods are slightly more expensive than generic dog foods and dog foods with fillers and preservatives, but as an owner of a dog with itchy paws you may find it worth it to make the switch. Along with the natural dog food you can give your dog dietary supplements such as fish oil and omega fatty acids. Fish oil helps soothe and hydrate the coat including paws, while the omega fatty acids help the immune system and overall health of the dog. Fill a bathtub with cool water and Epsom salts. Fill it, so it will cover the dog's paws and about one or two inches of its legs when standing in the water. Let them soak in this for 10 to 20 minutes, and don't let your dog drink the water. The cool water will soothe the itching, while the Epsom salts will treat any infection or irritation. Once the dog is out of the Epsom salts bath, apply one of the following topical remedies to your dogs paws: aloe, baking soda or talcum powder. Your dog may still bite and chew at his feet even with the topical, so you may want to keep an eye on them for awhile after the bath or put something over their paws such as Ace bandage, booties or baggies. Apple cider vinegar has also been successful in treating itchy paws and allergies in dogs. Put one tablespoon of apple cider vinegar in your dog's food twice each day for healthier skin and fur. Apply the apple cider vinegar to the dog's paws either directly or with a spray bottle. Within 24 hours, the itching symptoms should have decreased. If the dog has an open wound or exposed infection on the paw, dilute the apple cider vinegar with an equal amount of water before applying to the paws.